Please inform Vacation home Marjan in advance of your expected arrival time. You can use the Special Requests box when booking, or contact the property directly with the contact details provided in your confirmation. Apartment Grubic ~0,1 km, Split Situated in Split, Apartment Grubic presents self-catering accommodation with gratis wireless internet. There is a dining area and a kitchen complete with an oven, a fridge and stovetop. There is a private toilet with a bath. You can play tennis at the property, and the area is famous for scuba diving. 3 km from Apartment Grubic, while Poljud Stadium is 900 metres away. Plenty of adventures are offered in the area, for instance diving, biking and fishing. Kastel Sucurac ( ~ 4.2 km ): 31+ apartments. Kastel Gomilica ( ~ 4.6 km ): 39+ apartments, 10+ villas. Kastel Kambelovac ( ~ 5.3 km ): 29+ apartments. Kastel Luksic ( ~ 6.6 km ): 21+ apartments, 5+ villas, 3+ hotels. Kastel Stari ( ~ 7.3 km ): 41+ apartments, 5+ villas, 2+ hotels. 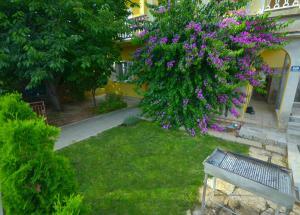 Solin ( ~ 7.4 km ): 13+ apartments. Beach Bacvice, Split ~ 1 km from Villa Marjan Sandy beach: recommended for young people, awarded with blue flag, with restaurant, with caffe bar, equipped with showers. Excellent choice of watersports. Beach Jezinac, Split ~ 1,2 km from Villa Marjan Gravel beach: ideal for families, recommended for young people, with restaurant, with caffe bar, equipped with showers. Excellent choice of watersports. Beach Kastelet, Split ~ 1,2 km from Villa Marjan Gravel beach: ideal for families, recommended for young people, with restaurant, equipped with showers. Beach Zenta, Split ~ 2,1 km from Villa Marjan Rocky beach: recommended for young people, with restaurant, with caffe bar. Excellent choice of watersports. Beach Bene, Split ~ 2,1 km from Villa Marjan Gravel beach: ideal for families, recommended for young people, with restaurant, with caffe bar, equipped with showers. Excellent choice of watersports. Restaurant Adriatic Graso, Split Guest reviews: 8,1/10 ~ 1,4 km from Villa Marjan Address: Uvala Baluni bb, 21000. Cuisine: Mediterranean cuisine. Restaurant Bistro Topolino, Split ~ 1,9 km from Villa Marjan Address: Obala K Domagoja BB, . Cuisine: Croatian cuisine. Restaurant Dvor, Split Guest reviews: 8,9/10 ~ 2,7 km from Villa Marjan Address: Put Firula 14, 21000. Prices: 78 HRK - 336 HRK. Cuisine: Barbecue, Mediterranean cuisine, Seafood. Restaurant Caffe bar Tenis, Split ~ 2,8 km from Villa Marjan Address: Put Firula 18, 21000. Restaurant konoba nevera, Split Guest reviews: 8,9/10 ~ 2,6 km from Villa Marjan Address: put firula 17, 021. Prices: 78 HRK - 308 HRK. Cuisine: Mediterranean cuisine.